Replies: 10 (Who? ), Viewed: 669 times. What kind of design decision have you made? I'm really struggling. I want to do more than just have a big tree and then the tombstone under it. My building style is maxis match, or silly in TS2, and I like to incorporate the goofy stuff too. Problem is, it hard. Pls, advice. Dissappointing entrance. My graveyard is pretty simple. It is a big lot, there is a church on it and a little flower shop. A sim of mine owns it, he hired employees (flower bouquet maker and a handyman for maintenance) He manage the cash register and also brings all graves to the graveyard. Nothing fancy, but I really like it. Ah, I meant a graveyard on your sims' lot. The lot where they live, not community lot. Or did you mean like a home business lot? Oh! My bad. I guess I didn't understand what you meant. No my graveyard is a community lot owned business. Though my Graveskeeper, has some stuff at his own home, to *help*...getting rid of unwanted neighbors. Is it a cow plant? Cool idea making the graveyard as a flower business. I do like the idea of a home business graveyard too. Raoul has a fenced in CowPlant yes, but usually, the Tombstone of Life & Death get the job done...better. This isn't really the same style as what you're doing (creepy run-down old cemetery), but you might like it anyway. I need to set aside some time to use some of this stuff at the Goth mansion. Esotheria has links to the fences, arch and gate that she used and also her original post with more screenshots. The original gate by Kativip was not updated for OFB and can't be locked. I'm not sure whether Esotheria fixed the version she uploaded or not. If not, you'll need to use SimPE to fix it per HugeLunatic's tutorial. it's really easy. My neighborhood cemetery is a very large owned lot occupied by "husband" and "wife" Simbots (aka Servos). I used Simbots so they could own the lot through all the generations of Sims that would come and go. The lot is entirely fenced in except for the entrance which has a brick welcoming arch leading to a stone walkway with benches and planters which the cemetery brochure calls a "relaxation area". Elsewhere on the lot are several fountains, some flower shrubs and a large cross as well as the Simbots' small one bedroom caretaker cottage. 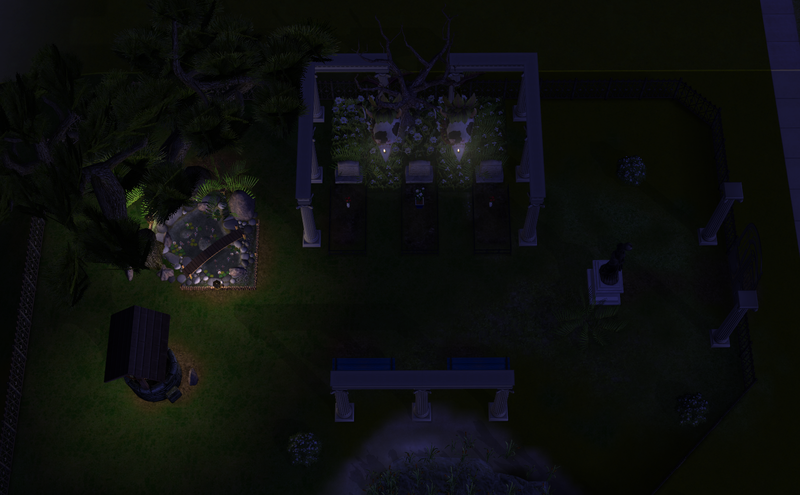 Each tombstone has at least one easel-drawn photograph of its dead Sim hanging over it so I can visually remember the Sim buried there. They do hang in midair so it's not realistic, but I don't mind. I've debated putting stone paths in between the rows of tombstones (there's more than 70 on the lot now), but haven't done that, partially because I worry about putting too much other content on the lot. It's already 5 times larger data-wise than any other lot in my hood with probably room for another 300 graves. And I don't know what would happen to the hood if the cemetery lot were to become corrupted. 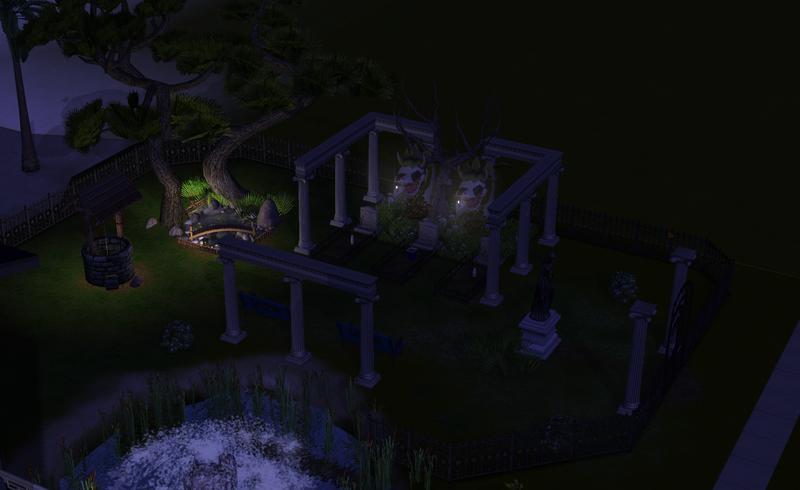 Some of my Sims have gravestones at their houses, and depending on their beliefs, will have different settings for those graves. The most common style is to have a stand of bamboo behind each grave, a blue-flowered bush on either side and little blue flowers in front. Typically, there will be a grassy path leading past the graves and where the lot has water, the graves will be nearby. Wealthier Sims may have a portrait of the dead Sim or a statue meant to depict that Sim next to the grave instead. Evil Sims may have leafless trees and prickly pear flowers near the graves at their homes... ...and some aspire to put their Resurrect-O-Nomitron in the area, too. (Good Sims who earn a Resurrect-O-Nomitron make less of a song and dance about their power, typically placing their resurrection item in a room not used for much else, certainly nowhere near any currently-dead Sims, that has plenty of space for all Sims involved and somewhere to sit down together to get up to speed on what happened since last time they were alive). Rematra Church and Cemetery is full for human occupation at 172 deceased sims. There are few personal graveyards, they are more decorated than their communal counterparts though. so far mainly one graveyard in a custom neighborhood. other graveyards/cemeteries in my game; mostly modifications of the pre-made ones.